ThousandEyes, which leverages a cloud platform to offer visibility throughout the global Internet, published its 2018 Public Cloud Performance Benchmark Report, comparing the global network performance of the three major public cloud providers—Amazon Web Services (AWS), Google Cloud Platform (GCP) and Microsoft Azure. The company says its results should be examined through the lens of the individual business planning or evaluating their cloud architectural choices as regional performance differences can make a significant impact in terms of performance gains or losses. The results are based on data gathered from periodically monitoring bi- directional network performance such as latency, packet loss and jitter to, within and between multiple global regions of the three public cloud providers over a four-week period. Architectural differences between providers impacts service delivery: AWS sends traffic over the Internet for the majority of the service delivery path, whereas GCP and Azure do not, instead using their own backbone networks. Increased exposure to the Internet means there is greater operational risk and impact on performance predictability. Performance variations by region: geographical performance variations exist across the three cloud providers, most noticeably in the LATAM and Asia regions. Decision-makers should consult the detailed findings to choose the best cloud provider on a per-region basis to ensure optimal performance globally. Multi-cloud network performance is strong: despite being competitors, the three providers peer directly with one another, eliminating the dependence on third-party ISPs. Plus, traffic almost never leaves the provider backbone networks, meaning there is very little loss and jitter in end-to-end communication. Decision-makers need not worry about performance in multi-cloud architectures. When connecting Europe to India, GCP exhibited three times the network latency compared to AWS and Azure. In Asia, GCP and Azure exhibited more network performance stability than AWS, which demonstrated 35% less network performance stability than GCP and 56% less than Azure. When connecting Europe to Singapore, AWS and GCP were 1.5 times slower than Azure. 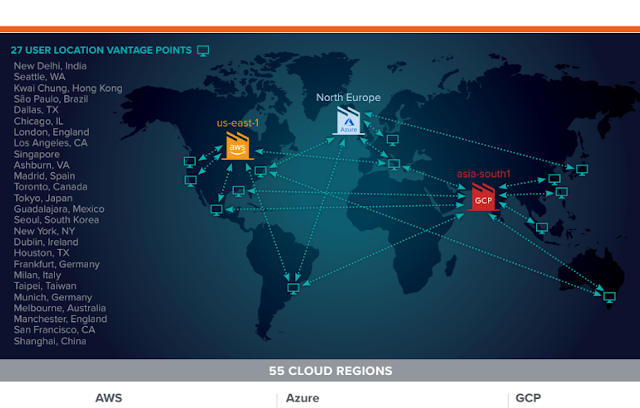 "Multi-national organizations that are embracing digital transformation and venturing into the cloud need to be aware of the geographical performance differences between the major public clouds when making global multi-cloud decisions," said Archana Kesevan, report author and senior product marketing manager at ThousandEyes. 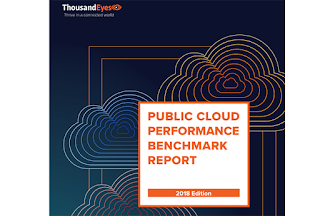 "To help global businesses with this assessment, ThousandEyes is providing an unbiased, third-party perspective on public cloud performance as it relates to end-user experience—and at the same time, breaking the mold of survey-based research and vendor-led reporting."